Mice lacking functional CD1d genes were used to study mechanisms of resistance to the protozoan parasite Toxoplasma gondii. Wild-type (WT) BALB/c mice, CD1d-deficient BALB/c mice, and WT C57BL/6 mice all survived an acute oral infection with a low dose of mildly virulent strain ME49 T. gondii cysts. In contrast, most CD1d-deficient C57BL/6 mice died within 2 wk of infection. Despite having parasite burdens that were only slightly higher than WT mice, CD1d-deficient C57BL/6 mice displayed greater weight loss and intestinal pathology. In C57BL/6 mice, CD4+ cells can cause intestinal pathology during T. gondii infection. Compared with WT mice, infected CD1d-deficient C57BL/6 mice had higher frequencies and numbers of activated (CD44high) CD4+ cells in mesenteric lymph nodes. Depletion of CD4+ cells from CD1d-deficient mice reduced weight loss and prolonged survival, demonstrating a functional role for CD4+ cells in their increased susceptibility to T. gondii infection. CD1d-deficient mice are deficient in Vα14+ T cells, a major population of NKT cells. Involvement of these cells in resistance to T. gondii was investigated using gene-targeted Jα18-deficient C57BL/6 mice, which are deficient in Vα14+ T cells. These mice did not succumb to acute infection, but experienced greater weight loss and more deaths than B6 mice during chronic infection, indicating that Vα14+ cells contribute to resistance to T. gondii. The data identify CD4+ cells as a significant component of the marked susceptibility to T. gondii infection observed in CD1d-deficient C57BL/6mice, and establish T. gondii as a valuable tool for deciphering CD1d-dependent protective mechanisms. The protozoan parasite, Toxoplasma gondii, has been a useful tool for dissecting innate and acquired immune protection against infection. Successful resistance to T. gondii involves several cell populations (reviewed in Ref. 1). During the acute phase of T. gondii infection, important protective roles are played by neutrophils (2, 3, 4), NK cells (5, 6, 7, 8, 9, 10, 11, 12, 13, 14), and macrophages (15, 16, 17, 18, 19). As the infection reaches the chronic phase, CD4+ and CD8+ T cells (20, 21, 22, 23, 24, 25, 26, 27, 28, 29) and B cells (30, 31, 32) play major protective roles. In addition to their protective functions, some cells mediate significant immunopathology during T. gondii infection. This is most evident as a CD4-dependent, IFN-γ-dependent necrosis of the ileum in the C57BL/6 (B6) mouse strain (33, 34). Thus, acute susceptibility to T. gondii infection can result from a dysregulated type 1 immune response as well as from deficiency in antiparasitic effector activities. In humans, the CD1 locus contains a family of five genes; however, CD1d is the sole representative of the family in the mouse (35). CD1 polypeptides are structurally related to MHC class I, and like class I, they form heterodimers with β2-microglobulin. CD1d is expressed on leukocytes including potential APCs (36). These features suggest that CD1 may have important immunological functions. Notably, CD1 molecules can bind and present both lipid and nonlipid Ags to T cells (37, 38), and CD1d-restricted T cells respond strongly to α-galactosylceramides (39). Thus, CD1d-restricted cells might respond to infection by recognizing lipid-associated pathogen Ags, as several studies have suggested (40, 41, 42). However, other studies have questioned whether there is a significant role for CD1d-dependent recognition of pathogen-associated lipid Ags (43, 44, 45). Many T cells that recognize CD1d have invariant rearrangements of their TCR α-chains (46). In the mouse, these cells preferentially express a Vα14Jα18 (formerly Jα281) rearrangement, although subpopulations of CD1d-restricted T cells exist that can use other Vα gene segments (47). NK cell markers (e.g., NK1.1) are also expressed on many CD1d-reactive cells (denoted NKT cells) (37, 48, 49). NKT cells have been implicated in resistance to various pathogens (41, 50, 51, 52, 53). Pertinent to the present study is a report of NKT cell involvement in resistance to T. gondii (54). That study found that mice deficient in MHC class II expression were protected against an i.p. challenge infection with highly virulent T. gondii after being vaccinated with an attenuated strain of Toxoplasma, but were not protected if CD4+ cells or NK1.1+ cells were depleted during vaccination. The protective cells were postulated to be CD1d restricted (55). Gene-targeted mice lacking functional CD1d genes or lacking CD1d-restricted cells have been generated for study of CD1d-dependent immune mechanisms (56, 57, 58, 59). CD1d-deficient mice are reported to be more susceptible to some viruses (51, 52, 57, 60), bacteria (53, 61, 62, 63), and protozoa (41, 42, 64, 65). Together, infection studies suggest that CD1d-restricted cells and CD1d-dependent mechanisms play an important protective role during infection. However, the details of such protective mechanisms remain to be deciphered. Although infected CD1d-deficient mice and wild-type (WT)3 controls may differ in various immune responses, e.g., production of IFN-γ (60, 63, 64) or IL-12 (57), it is not clear that such differences are the cause of greater susceptibility to infections in CD1d-deficient mice. Thus, the mechanisms underlying impaired resistance of infected CD1d-deficient mice have not been adequately resolved. Although T. gondii has been widely used to identify important protective roles for a broad range of cells and cytokine mediators during infection, there has been, until now, no explicit study of CD1d-dependent mechanisms during T. gondii infection. Relevant to the present study is a model proposed by Brenner and colleagues (35) that outlines potential interactions between CD1d-restricted cells and other cell populations during infection. Those populations include many cells well documented to play important roles in resistance to T. gondii, including polymorphonuclear leukocytes, macrophages, and lymphocytes. In the present study, we have investigated the role of CD1d in resistance to infection, using the highly informative T. gondii infection model. Our results indicate that a CD1d-dependent mechanism influences CD4+ cell responses during acute infection, and potentially regulates pathological effects associated with this population. In addition, our results indicate that Vα14+ cells contribute to protection during chronic T. gondii infection. Male C57BL/6J (B6) mice and gene-targeted CD1d-deficient mice (B6.C129S-Cd1tm1Gru, denoted CD1d-deficient B6) (56), which were backcrossed to C57BL/6 mice for 10 generations, were bred at Trudeau Institute. C.129S2-Cd1tm1Gru (CD1d-deficient BALB/c) mice were obtained from The Jackson Laboratory. Male mice deficient in Vα14+ cells (Jα18−/− mice; Ref. 59) were bred at the University of Vermont from a stock provided originally by M. Taniguchi (Yokohama Institute, Yokohama City, Japan). Control B6 and BALB/cJ mice were bred at Trudeau Institute or obtained from commercial suppliers. Mice were between 6 and 10 wk old at the start of experiments. Mice were housed on ventilated racks in sterilized cages and were given laboratory chow and acidified water ad libitum. Mice at Trudeau Institute are free of known common viral pathogens of mice as evidenced by periodic screening of sera from sentinel mice, performed by the University of Missouri Research Animal Diagnostic and Investigative Laboratory (Columbia, MO). All experimental protocols were reviewed and approved by Trudeau Institute Animal Care and Use Committee. Trudeau Institute is fully accredited by the Association for Assessment and Accreditation of Laboratory Animal Care. Mice were infected by peroral inoculation of 10 ME49 cysts. Cysts were prepared from brains of chronically infected B6 mice as previously described (66) and diluted to a concentration of 100 per milliliter in HBSS. In each experiment, groups of sham-infected mice were included that received equal volumes of brain suspension from uninfected B6 mice. Levels of IFN-γ in sera were assayed by ELISA as previously described (11). Parasites in tissues were quantified by a real-time PCR-based method (67). The assay measures expression of the Sag1 gene (P30), which is limited to tachyzoites (68), the proliferative form of the parasite. Relative amounts of cytokine mRNA in various tissues of mice were estimated using a real-time PCR-based method essentially as described elsewhere (69). Briefly, RNA was isolated from tissues, cDNA prepared, amplified, and quantified using primers and probes listed below. Levels of PCR product were normalized to a housekeeping gene (GAPDH). Cytokine data are presented as the mean log10 fold-increase above levels in uninfected control mice. Primers and probes were as follows: P30, forward, TTTCCGAAGGCAGTGAGACG; P30, reverse, GGATCCGATGCCATAGCG; P30, probe, TTGCCGCGCCCACACTGATG; IFN-γ, forward, CATTGAAAGCCTAGAAAGTCTGAATAAC; IFN-γ, reverse, TGGCTCTGCAGGATTTTCATG; IFN-γ, probe, TCACCATCCTTTTGCCAGTTCCTCCAG; IL-12p40, forward, GGAAGCACGGCAGCAGAATA; IL-12p40, reverse, AACTTGAGGGAGAAGTAGGAATGG; IL-12p40, probe, CATCATCAAACCAGACCCGCCCAA; GAPDH, forward, CTCGTCCCGTAGACAAAATGG; GAPDH, reverse, AATCTCCACTTTGCCACTGCA; GAPDH, probe, CGGATTTGGCCGTATTGGGCG. Mice were depleted of CD4+ cells by treatment with 1 mg of anti-CD4 (clone GK1.5) i.p. on days 0 and 2 relative to inoculation of cysts. Equal amounts of an isotype-matched Ab of irrelevant specificity was given as a control. The surface Ag phenotype of spleen and mesenteric lymph node cells was determined by flow cytometry using the following Abs: anti-CD4 (clone GK1.5), anti-CD8α (clone 53-6.7), anti-CD44 (clone IM7), anti-NK1.1 (clone PK136), anti-Gr1 (clone RB6-8C5). Cells were preincubated with Fc block (clone 2.4G2) before staining. Pieces of liver, ileum, lung, spleen, and brain were fixed in 10% neutral-buffered formalin, mounted in paraffin, sectioned (5 μm), and stained with H&E. Slides were evaluated in a masked manner by one of us (W. Chen). Except where noted otherwise, there were five mice per experimental treatment group. Survival of mice in different groups was compared using the log rank test. Other measurements were compared statistically using Student’s t test. Where appropriate, data were log-transformed to satisfy requirements for use of the t test. Results were confirmed in at least two replicate experiments, unless otherwise stated. To assess whether CD1d deficiency renders mice susceptible to T. gondii infection, groups of CD1d-deficient B6 and BALB/c male mice and WT controls were infected orally with ME49 cysts. BALB/c CD1d-deficient mice were resistant to oral infection with 10 T. gondii cysts (Fig. 1⇓A) or with 100 cysts (data not shown). In contrast, CD1d-deficient B6 mice experienced significantly greater weight loss (p < 0.05) and mortality (p < 0.01) than WT controls when orally infected with 10 T. gondii (Fig. 1⇓, B and C). Parasite burdens in tissues of CD1d-deficient B6 mice and controls on day 8 or 9 of infection were determined in three experiments. Burdens trended moderately higher in ileums of CD1d-deficient B6 mice than in WT B6 mice (Table I⇓) (average fold difference = 4.7) but reached statistical significance (p < 0.05) in only one experiment. In contrast, there were no remarkable differences in parasite burdens in the livers (Table I⇓) or lungs (data not shown). The results demonstrate that CD1d-deficient B6 mice are markedly susceptible to oral infection with T. gondii parasites but harbor only modestly higher parasite burdens in some tissues. CD1d-deficient B6 mice, but not CD1d-deficient BALB/c mice, are acutely susceptible to oral infection with T. gondii. Groups of five mice were infected orally with 10 ME49 cysts or sham-infected. A, BALB/c mice. Body weights and survival of WT BALB/cJ and CD1d-deficient BALB/cJ mice did not differ significantly. B, B6 mice. Loss of weight was significantly greater (p < 0.05) in infected CD1d-deficient B6 mice than in infected WT controls. C, Survival data pooled from three experiments. The difference in survival between WT B6 (n = 10) and CD1d-deficient B6 mice (n = 15) is significant (p < 0.01). To assess pathological effects of T. gondii infection, groups of CD1d-deficient B6 mice and WT B6 controls were infected orally with 10 ME49 cysts and killed 8 days later for histological analysis. Sham-infected WT and CD1d-deficient mice showed no significant pathology. The ileums of infected WT B6 mice showed subacute enteritis, but no necrosis, along with occasional sloughing of villous epithelial cells, focal blunting and thickening of intestinal villi, and hypercellularity in the lamina propria. Some crypts were dilated and filled with necrotic cellular debris. There were increased numbers of intraepithelial cells but reduced numbers of Paneth cells. In comparison with infected WT B6 mice, the ileums of infected CD1d-deficient B6 mice were more severely affected, with more extensive infiltration of mononuclear cells in the lamina propria and more pronounced blunting and thickening of intestinal villi and sloughing of epithelial cells. The crypts were severely dilated. There were many bacteria, along with necrotic cellular debris, and many inflammatory cells in the intestinal lumens. These findings are illustrated in Fig. 2⇓. 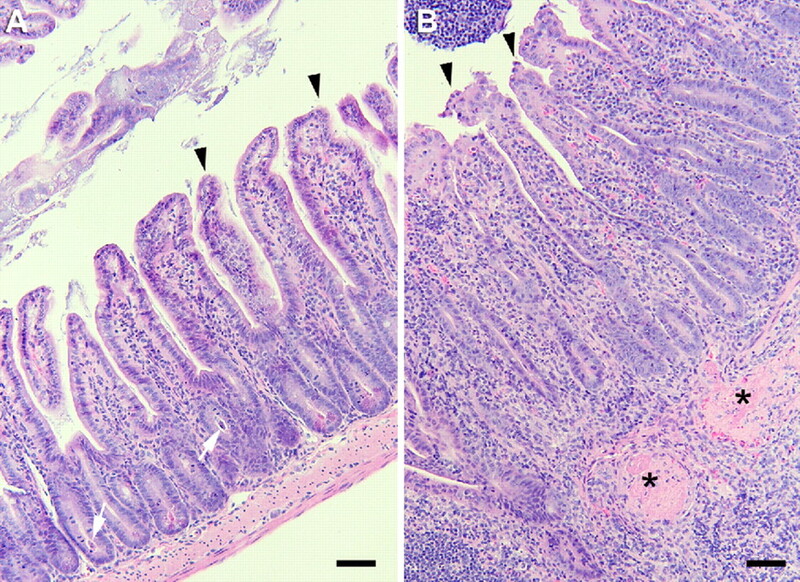 Intestinal pathology in T. gondii-infected WT B6 and CD1d-deficient B6 mice. A, Small intestine from a WT B6 mouse killed on day 8 postinfection showing mild to moderate infiltration of mononuclear cells in the lamina propria, occasional sloughing of individual epithelial cells at the tips of intestinal villi (arrowheads), and the accumulation of necrotic cellular debris in the cryptic lumens (arrows). B, Small intestine from a CD1d-deficient B6 mouse killed on day 8 postinfection showing severe and extensive infiltration of mononuclear cells throughout the entire intestinal lamina propria, focal ulceration of the tips of villi (arrowheads), and focal necrosis in the submucosal regions (∗). H&E; bar, 40 μm. Spleens, lungs, livers, and brains were also examined. All infected spleens were enlarged relative to sham-infected controls, and showed increased numbers of epithelioid cells and reticuloendothelioid cells in the red pulp. The lesions in infected CD1d-deficient spleens were slightly more severe than those in infected WT spleens, with more cellular debris, apoptotic/necrotic cells, and neutrophils (data not shown). Lungs of all infected mice exhibited mild pneumonitis consisting of focal thickening and hypercellularity of interalveolar septa, perivascular accumulation on mononuclear cells, focal infiltration of mononuclear cells around terminal airways, and leukocyte margination in some of the associated blood vessels. These changes were slightly more severe in CD1d-deficient mice (data not shown). Livers of all infected mice had multiple areas of hepatic necrosis and multiple foci of mononuclear cell infiltrates throughout the hepatic parenchyma and perivascular areas. However, these effects were generally milder in the CD1d-deficient infected livers. No significant effects of infection were observed in the brains (data not shown). T. gondii infection evokes strong type 1 inflammatory responses that are required for control of infection (1, 70), but may also promote immunopathology (33, 34). Therefore, in view of the increased susceptibility and enhanced immunopathology observed in infected CD1d-deficient B6 mice, we investigated whether type 1 immune responses were significantly different in infected WT B6 and CD1d-deficient B6 mice. Levels of serum IFN-γ, but not IL-12p40, were significantly (p < 0.05) elevated in infected CD1d-deficient mice at 8 days of infection (Fig. 3⇓A). Because the most severe pathology was evident in the ileums of infected CD1d-deficient mice, we also examined the levels of IFN-γ and IL-12p40 mRNA in that tissue. IFN-γ mRNA was significantly (p < 0.05) elevated in CD1d-deficient mice compared with infected control mice (Fig. 3⇓B). IL-12p40 levels were also moderately elevated (p = 0.09) in the experiment shown, and in a replicate experiment (p < 0.05) (not shown). Serum cytokines and ileal mRNA levels in WT B6 and CD1d-deficient B6 mice infected with T. gondii. A, Sera were harvested on day 8 postinfection. Values depict means ± SD. The difference in IFN-γ was significant (p < 0.05, n = 5 mice per group). B, mRNA was isolated from ileums of infected mice on day 8 postinfection. Values depict log10 mean ± SD increase above that of sham-infected controls of the same strain. The difference in IFN-γ between WT B6 and CD1d-deficient B6 mice is significant (p < 0.05, n = 5 mice per group). Significant differences are denoted by an asterisk (∗). CD4+ T cells and IFN-γ mediate a lethal intestinal pathology in WT B6 mice infected orally with 100 ME49 cysts (33, 34, 71). Even if infected with only 10 cysts, WT B6 mice developed sublethal intestinal pathology (Fig. 2⇑). 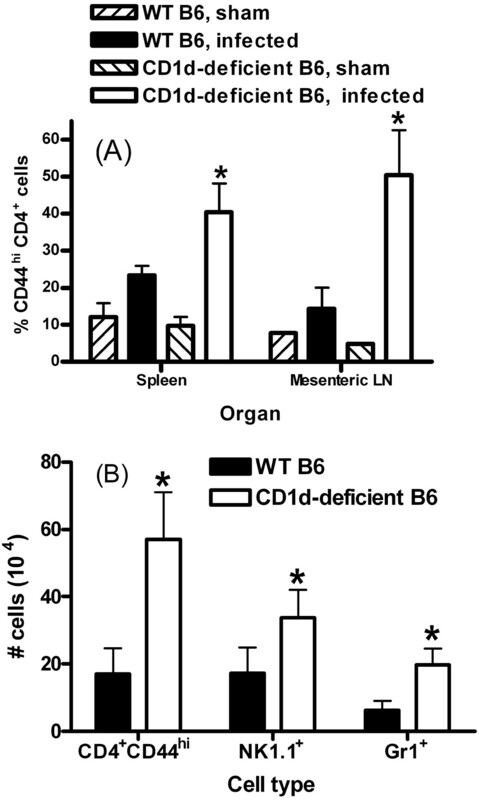 We therefore examined whether there were differences between infected CD1d-deficient B6 mice and WT B6 mice in the frequency or numbers of activated CD4+ T cells in lymphoid tissues. A higher frequency of activated (CD44high) CD4+ cells was observed both in spleens and mesenteric lymph nodes of infected CD1-deficient mice at 8 days into infection (Fig. 4⇓A). In addition, significantly more activated CD4+ cells along with NK1.1+ cells (NK cells and some activated T cells; Refs. 72 and 73) and Gr1+ cells (granulocytes and some macrophages) were found in mesenteric lymph nodes of CD1d-deficient mice (Fig. 4⇓B), but not in spleens (data not shown). Thus, cells with the potential to mediate intestinal immunopathology are present in greater numbers in the gut-draining lymph nodes of infected CD1d-deficient B6 mice. Elevated numbers of activated CD4+ T cells in mesenteric lymph nodes of T. gondii-infected CD1d-deficient B6 mice. Spleens and mesenteric lymph nodes were harvested from WT B6 and CD1d-deficient B6 mice on day 8 postinfection. A, Percentage of CD4+ cells with a CD44high phenotype. B, Numbers of CD4+ cells with a CD44high phenotype in mesenteric lymph nodes. Numbers of cells in the different populations were obtained by multiplying counts of cells per organ by the percentages obtained by flow cytometry. Bars denote mean ± SD from three or four mice per group. ∗, Significantly (p < 0.05) elevated compared with infected WT B6 mice. We next assessed the contribution of CD4+ T cells to acute death and intestinal immunopathology in orally infected CD1d-deficient B6 mice. 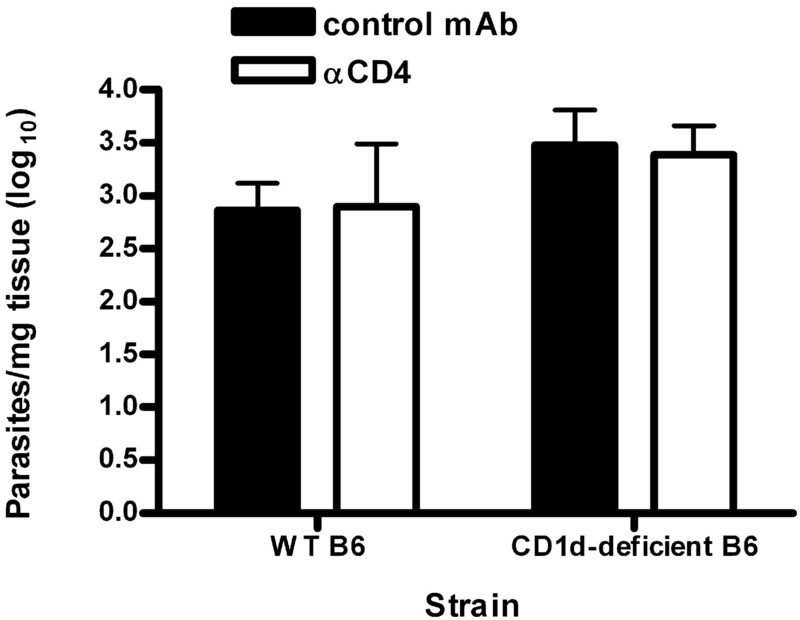 Groups of CD1d-deficient B6 mice and WT B6 controls were treated with a mAb that depletes CD4+ cells, or with an isotype-matched control mAb, and infected orally with 10 ME49 cysts. As shown in Fig. 5⇓A, CD4-depleted CD1d-deficient mice lost significantly (p < 0.05) less body weight by day 12. Most importantly, the mice survived significantly longer (p < 0.05) than CD1d-deficient mice treated with a control mAb (Fig. 5⇓B). A significant difference in body weight loss was evident as early as day 9 in a replicate experiment (not shown). These results demonstrate that CD4+ T cells contribute substantially to the acute death and exacerbated weight loss in infected CD1d-deficient mice. 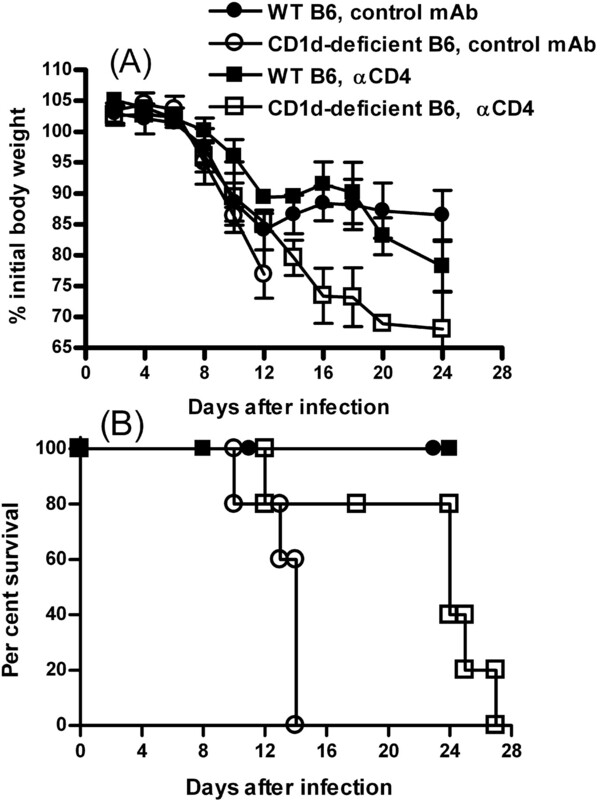 Changes in survival and weight loss of T. gondii-infected WT B6 and CD1d-deficient B6 mice treated with Abs to deplete CD4+ cells. A, Weight loss. Values are mean ± SD percent initial body weights of mice given anti-CD4 or an isotype-matched control mAb (1 mg i.p. on days 0 and 2 relative to infection). The difference in body weight between anti-CD4-treated and control mAb-treated CD1d-deficient mice was significant (p < 0.05) by day 12, but could not be tested beyond that time owing to the deaths of CD1d-deficient mice in the control mAb-treated group. B, Survival. Anti-CD4-treated CD1d-deficient mice survived significantly (p < 0.05) longer than control mAb-treated CD1d-deficient mice. In each experiment, there were five mice per treatment group. To determine whether the depletion of CD4+ cells increased the resistance of CD1d-deficient mice simply by altering parasite numbers in the ileum, we measured parasite levels in anti-CD4-treated and control mice at 8 days of infection. As shown in Fig. 6⇓, there were no significant differences in parasite burdens in ileums of CD1d-deficient mice as a result of anti-CD4 treatment. Parasite burdens in the ileums of T. gondii-infected WT B6 and CD1d-deficient B6 mice treated with anti-CD4 or a control mAb. Parasites numbers in ileums of mice infected for 9 days were determined by a real-time PCR-based method (Materials and Methods). Values are log10 mean number ± SD of parasites per milligram of tissue. n = 4 mice per group. CD1d-deficient mice lack a population of Vα14+ Τ cells having an NK1.1+ phenotype (46). Therefore, to determine whether the increased susceptibility of CD1d-deficient mice during T. gondii infection is a consequence of a deficiency in Vα14-expressing cells, we compared the course of infection in Vα14-deficient B6 mice and WT B6 controls. No early deaths were observed in either group after oral infection with 10 ME49 cysts. However, Vα14-deficient B6 mice were more susceptible than WT B6 mice later in the infection (Fig. 7⇓A), suggesting a role for NKT cells during chronic T. gondii infection. Weight loss was similar in the two groups for ∼2 wk, after which, Vα14-deficient mice displayed somewhat greater weight loss, reaching statistical significance (p < 0.05) by day 20 (Fig. 7⇓B). Loss of body weight was examined in a third experiment in which mice were given 40 cysts instead of 10 (Fig. 7⇓C). Vα14-deficient mice again lost more weight than WT controls, and the difference was evident sooner than in mice given only 10 cysts (Fig. 7⇓A). Overall, Vα14-deficient B6 mice were as resistant as WT B6 mice during the initial period of T. gondii infection, but showed more weight loss and greater susceptibility as the infection progressed to the chronic phase. Survival and body weights of T. gondii-infected WT B6 and Vα14-deficient B6 mice. A, Survival of groups of 10 WT B6 and Vα14-deficient (Jα18-deficient) B6 mice infected orally with 10 ME49 cysts. Data pooled from two experiments. Significantly (p = 0.013) greater mortality was evident in Vα14-deficient mice. B, Body weights of groups of five mice orally infected with 10 ME49 cysts. Differences in body weight are significant (p < 0.01) from day 20 onward. Asterisks (∗) denote significant differences. C, Body weights of groups of five mice orally infected with 40 ME49 cysts. Differences in weight were significant (p < 0.05) from day 12 onward. Not shown are weights beyond day 16, when there were some deaths in the Vα14-deficient group. Our results show that expression of CD1d can be crucial for survival of mice infected with T. gondii. Specifically, we demonstrate that B6 mice lacking CD1d experience severe weight loss and succumb to acute T. gondii infection with exacerbated intestinal pathology. CD1d-deficient B6 mice also exhibit increased numbers of activated CD4+ cells and higher IFN-γ responses. Furthermore, death is delayed and weight loss is less severe if the mice are depleted of CD4+ cells at the time of infection. Thus, there is a link between a CD1d-dependent mechanism of resistance to T. gondii and pathological effects of CD4+ T cells. T. gondii-infected B6 mice are prone to intestinal pathology mediated by CD4+ T cells and type 1 cytokines, whereas BALB/c mice are not (33, 34). Significantly, in this study, CD1d-deficient B6 mice were susceptible to T. gondii infection and CD1d-deficient BALB/c mice were not. We speculate that the well-documented difference between B6 and BALB/c mice in susceptibility to CD4-dependent intestinal pathology may be a major reason for the contrasting outcomes in the two CD1d-deficient strains when infected with T. gondii. However, we recognize that other factors may be involved, because differences between CD1d-deficient B6 and BALB/c background mice have been seen in immune responses to infections that do not involve intestinal pathology (60, 64). Because CD1d-deficient mice lack a population of Vα14-expressing NKT cells, a plausible hypothesis is that this deficiency is a cause of increased susceptibility of CD1d-deficient mice. Indeed, a role for NKT cells in resistance to T. gondii was previously shown in MHC class II-deficient mice using a vaccination/challenge model (54) in which the protective cells were postulated to be CD1d restricted (55). However, our results indicate that, during acute primary infection, a deficiency of Vα14+ cells did not lead to greater weight loss or mortality. Nonetheless, a protective role for Vα14-expressing cells, presumably NKT cells, was evident during chronic infection (Fig. 7⇑), when acquired immune protective mechanisms come strongly into play (1). Although Vα14+ NKT cells are a major population of CD1d-restricted cells, mice possess additional CD1d-restricted populations, denoted nonclassical NKT cells. Nonclassical NKT cells are activated in a mouse model of hepatitis B virus infection (74), and CD1d-restricted human cells not bearing an invariant TCR (Vα24−) are activated by nonlipidic small molecules (38). These examples reveal that CD1d-dependent resistance mechanisms may involve more than Vα14+ NKT cells, as our acute survival data suggest. How might a CD1d-restricted mechanism mediate resistance to T. gondii? Possibly a CD1d-dependent mechanism down-regulates potentially pathological effects of CD4+ T cells during infection. Consistent with this idea is our observation that CD4+ T cells with an activated phenotype are present in greater numbers in the lymph nodes draining the intestine of orally infected CD1d-deficient B6 mice than in controls (Fig. 4⇑). In addition, levels of serum IFN-γ protein and IFN-γ mRNA in the ileum were elevated in T. gondii-infected CD1d-deficient B6 mice compared with WT mice (Fig. 3⇑). Notably, a previous study found higher IFN-γ, IL-12, and IL-4 responses to viral infection in CD1d-deficient mice than in WT mice, and elevated numbers of IFN-γ-producing spleen cells (75). Consistent with that work, our findings suggest that potentially pathological cytokines are dysregulated in CD1d-deficient mice. Prior studies have clearly demonstrated an important role for IL-10 in regulating intestinal immunopathology induced by oral T. gondii infection (71). In this context, it is noteworthy that gene-targeted mice that develop chronic inflammation of the colon generate a population of IL-10-producing B cells in which CD1d is up-regulated (76). Furthermore, expression of CD1d on murine gastrointestinal epithelium has been reported (77), and CD1 ligation can induce IL-10 expression in intestinal epithelium (78). Thus, in the absence of CD1d expression, the ability to regulate intestinal inflammation via IL-10 might be lost. In addition to IL-10, TGF-β has been shown to play a critical role in controlling the ileitis induced by oral T. gondii infection (79). Three experiments were performed to determine whether differences in potential regulatory cytokines, such as IL-10 or TGF-β, could explain the difference in susceptibility between WT and CD1d-deficient mice. TGF-β mRNA levels in ileums did not differ significantly. IL-10 mRNA levels were moderately lower (2-fold) in CD1d-deficient mice in one experiment but not significantly lower in the other two. We conclude that different IL-10 and TGF-β mRNA levels in ileums are unlikely to explain the differential susceptibility of CD1d-deficient mice and WT mice to acute T. gondii infection. An alternative explanation for the susceptibility of CD1d-deficient mice supposes that CD1d-deficient mice lack an undefined CD1d-dependent mechanism directly able to control parasites. CD1d-restricted cells can be directly cytolytic to some targets via perforin-dependent or granzyme-dependent mechanisms (59, 80) and therefore may possess antiparasite effector functions. The trend toward higher parasite numbers we observed in the ileums of CD1d-infected mice (Table I⇑) is consistent with impaired antiparasite effector functions in CD1d-deficient mice. A compromised ability to control parasites in that vital tissue, combined with the inherent susceptibility of B6 mice to CD4-mediated intestinal pathology, might well be sufficiently harmful to cause death of the mice. Defining which, if any, of these possibilities is the correct explanation for the remarkable susceptibility of CD1d-deficient B6 mice to infection with T. gondii is the subject of ongoing studies. We thank members of the Trudeau Institute Animal Breeding Facility for their care of the animals used in this study. ↵1 This work was supported by National Institute of Allergy and Infectious Diseases Grants AI-46571 and AI-61587 (to L.L.J.) and HL-72937 (to S.T.S.). ↵3 Abbreviation used in this paper: WT, wild type. Denkers, E. Y., R. T. Gazzinelli. 1998. Regulation and function of T-cell-mediated immunity during Toxoplasma gondii infection. Clin. Microb. Rev. 11: 569-588. Bliss, S. K., B. A. Butcher, E. Y. Denkers. 2000. Rapid recruitment of neutrophils containing prestored IL-12 during microbial infection. J. Immunol. 165: 4515-4521. Bliss, S. K., L. C. Gavrilescu, A. Alcaraz, E. Y. Denkers. 2001. Neutrophil depletion during Toxoplasma gondii infection leads to impaired immunity and lethal systemic pathology. Infect. Immun. 69: 4898-4905. Sayles, P. C., L. L. Johnson. 1997. Exacerbation of toxoplasmosis in neutrophil-depleted mice. Nat. Immun. 15: 249-258. Gazzinelli, R. T., S. Hieny, T. A. Wynn, S. Wolf, A. Sher. 1993. Interleukin 12 is required for the T-lymphocyte-independent induction of interferon-γ by an intracellular parasite and induces resistance in T-cell-deficient hosts. Proc. Natl. Acad. Sci. USA 90: 6115-6119. Gazzinelli, R. T., M. Wysocka, S. Hayashi, E. Y. Denkers, S. Hieny, P. Caspar, G. Trinchieri, A. Sher. 1994. Parasite-induced IL-12 stimulates early IFN-γ synthesis and resistance during acute infection with Toxoplasma gondii. J. Immunol. 153: 2533-2543. Hunter, C. A., E. Candolfi, C. Subauste, V. Van Cleave, J. S. Remington. 1995. Studies on the role of interleukin-12 in acute murine toxoplasmosis. Immunology 84: 16-20. Hunter, C. A., R. Chizzonite, J. S. Remington. 1995. IL-1β is required for IL-12 to induce production of IFN-γ by NK cells: a role for IL-1β in the T cell-independent mechanism of resistance against intracellular pathogens. J. Immunol. 155: 4347-4354. Hunter, C. A., C. S. Subauste, V. H. Van Cleave, J. S. Remington. 1994. Production of γ-interferon by natural killer cells from Toxoplasma gondii-infected SCID mice: regulation by interleukin-10, interleukin-12, and tumor necrosis factor-α. Infect. Immun. 62: 2818-2824. Johnson, L. L., P. C. Sayles. 1995. Strong cytolytic activity of natural killer cells is neither necessary nor sufficient for preimmune resistance to Toxoplasma gondii. Nat. Immun. 14: 209-215. Johnson, L. L., F. P. VanderVegt, E. A. Havell. 1993. γ-Interferon-dependent temporary resistance to acute Toxoplasma gondii infection independent of CD4+ or CD8+ lymphocytes. Infect. Immun. 61: 5174-5180. Sher, A., I. P. Oswald, S. Hieny, R. T. Gazzinelli. 1993. Toxoplasma gondii induces a T-independent IFN-γ response in natural killer cells that requires both adherent accessory cells and tumor necrosis factor-α. J. Immunol. 150: 3982-3989. Suzuki, Y., M. A. Orellana, R. D. Schreiber, J. S. Remington. 1988. Interferon-γ: the major mediator of resistance against Toxoplasma gondii. Science 240: 516-518. Suzuki, Y., F. K. Conley, J. S. Remington. 1990. Treatment of toxoplasmic encephalitis in mice with recombinant γ-interferon. Infect. Immun. 58: 3050-3055. Langermans, J. A., M. E. Van der Hulst, P. H. Nibbering, P. S. Hiemstra, L. Fransen, R. Van Furth. 1992. 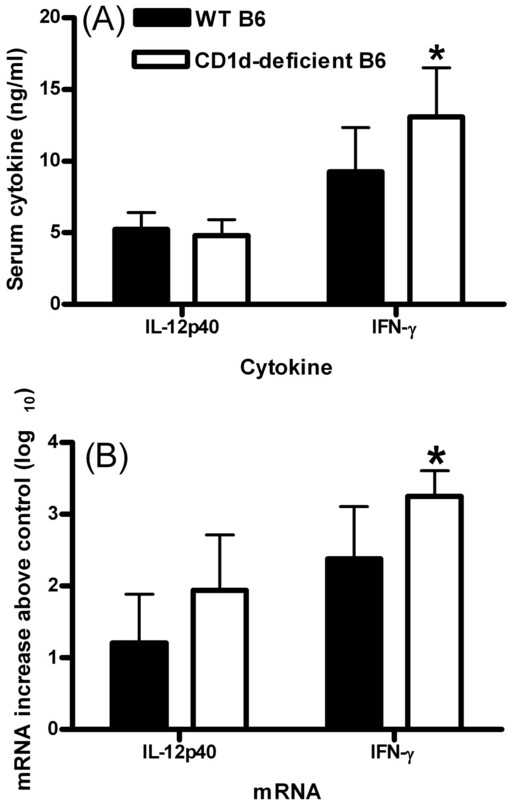 IFN-γ-induced l-arginine-dependent toxoplasmastatic activity in murine peritoneal macrophages is mediated by endogenous tumor necrosis factor-α. J. Immunol. 148: 568-574. Langermans, J. A., M. E. van der Hulst, P. H. Nibbering, R. van Furth. 1992. Endogenous tumor necrosis factor-α is required for enhanced antimicrobial activity against Toxoplasma gondii and Listeria monocytogenes in recombinant γ-interferon-treated mice. Infect. Immun. 60: 5107-5112. Murray, H. W., Z. A. Cohn. 1979. Macrophage oxygen-dependent antimicrobial activity. I. Susceptibility of Toxoplasma gondii to oxygen intermediates. J. Exp. Med. 150: 938-949. Remington, J. S., T. C. Merigan. 1968. Interferon: protection of cells infected with an intracellular protozoan (Toxoplasma gondii). Science 161: 804-806. Remington, J. S., J. L. Krahenbuhl, J. W. Mendenhall. 1972. A role for activated macrophages in resistance to infection with Toxoplasma. Infect. Immun. 6: 829-834. Araujo, F. G.. 1992. Depletion of CD4+ T cells but not inhibition of the protective activity of IFN-γ prevents cure of toxoplasmosis mediated by drug therapy in mice. J. Immunol. 149: 3003-3007. Araujo, F. G.. 1991. Depletion of L3T4+ (CD4+) T lymphocytes prevents development of resistance to Toxoplasma gondii in mice. Infect. Immun. 59: 1614-1619. Brown, C. R., R. McLeod. 1990. Class I MHC genes and CD8+ T cells determine cyst number in Toxoplasma gondii infection. J. Immunol. 145: 3438-3441. Gazzinelli, R., Y. Xu, S. Hieny, A. Cheever, A. Sher. 1992. Simultaneous depletion of CD4+ and CD8+ T lymphocytes is required to reactivate chronic infection with Toxoplasma gondii. J. Immunol. 149: 175-180. Khan, I. A., L. Casciotti. 1998. IL-15 prolongs the duration of CD8+ T cell-mediated immunity in mice infected with a vaccine strain of Toxoplasma gondii. J. Immunol. 163: 4503-4509. Khan, I. A., K. H. Ely, L. H. Kasper. 1994. Antigen-specific CD8+ T cell clone protects against acute Toxoplasma gondii infection in mice. J. Immunol. 152: 1856-1860. Nagasawa, H., T. Manabe, Y. Maekawa, M. Oka, K. Himeno. 1991. Role of L3T4+ and Lyt-2+ T cell subsets in protective immune responses of mice against infection with a low or high virulent strain of Toxoplasma gondii. Microbiol. Immunol. 35: 215-222. Parker, S. J., C. W. Roberts, J. Alexander. 1991. CD8+ T cells are the major lymphocyte subpopulation involved in the protective immune response to Toxoplasma gondii in mice. Clin. Exp. Immunol. 84: 207-212. Shirahata, T., T. Yamashita, C. Ohta, H. Goto, A. Nakane. 1994. CD8+ T lymphocytes are the major cell population involved in the early γ-interferon response and resistance to acute primary Toxoplasma gondii infection in mice. Microbiol. Immunol. 38: 789-796. Suzuki, Y., J. S. Remington. 1988. Dual regulation of resistance against Toxoplasma gondii infection by Lyt-2+ and Lyt-1+, L3T4+ T cells in mice. J. Immunol. 140: 3943-3946. Johnson, L. L., P. C. Sayles. 2002. Deficient humoral responses underlie susceptibility to Toxoplasma gondii in CD4-deficient mice. Infect. Immun. 70: 185-191. Kang, H., J. S. Remington, Y. Suzuki. 2000. Decreased resistance of B cell-deficient mice to infection with Toxoplasma gondii despite unimpaired expression of IFN-γ, TNF-α, and inducible nitric oxide synthase. J. Immunol. 164: 2629-2634. Sayles, P. C., G. W. Gibson, L. L. Johnson. 2000. B cells are essential for vaccination-induced resistance to virulent Toxoplasma gondii. Infect. Immun. 68: 1026-1033. Liesenfeld, O., J. Kosek, J. S. Remington, Y. Suzuki. 1996. Association of CD4+ T cell-dependent interferon-γ-mediated necrosis of the small intestine with genetic susceptibility of mice to peroral infection with Toxoplasma gondii. J. Exp. Med. 184: 597-607. Liesenfeld, O., H. Kang, D. Park, T. A. Nguyen, C. V. Parkhe, H. Watanabe, T. Abo, A. Sher, J. S. Remington, Y. Suzuki. 1999. TNF-α, nitric oxide, and IFN-γ are all critical for development of necrosis in the small intestine and early mortality in genetically susceptible mice infected perorally with Toxoplasma gondii. Parasite Immunol. 21: 365-376. Brigl, M., M. B. Brenner. 2004. CD1: antigen presentation and T cell function. Annu. Rev. Immunol. 22: 817-890. Brossay, L., D. Jullien, S. Cardell, B. C. Sydora, N. Burdin, R. L. Modlin, M. Kronenberg. 1997. Mouse CD1 is mainly expressed on hemopoietic-derived cells. J. Immunol. 159: 1216-1224. Bendelac, A., O. Lantz, M. E. Quimby, J. W. Yewdell, J. R. Bennink, R. R. Brutkiewicz. 1995. CD1 recognition by mouse NK1+ T lymphocytes. Science 268: 863-865. Van Rijn, I., D. C. Young, J. S. Im, S. B. Levery, P. A. Illarionov, G. S. Besra, S. A. Porcelli, J. Gumperz, T.-Y. Cheng, D. B. Moody. 2004. CD1d-restricted T cell activation by nonlipidic small molecules. Proc. Natl. Acad. Sci. USA 101: 13578-13583. Kawano, T., J. Cui, Y. Koezuka, I. Toura, Y. Kaneko, K. Motoki, H. Uenon, R. Nakagawa, H. Sata, E. Kondo, et al 1997. CD1d-restricted and TCR-mediated activation of vα14NKT cells by glycosylceramides. Science 278: 1626-1629. Schofield, L., M. J. McConville, D. Hansen, A. S. Campbell, B. Fraser-Reid, M. J. Grusby, S. D. Tachado. 1999. CD1d-restricted immunoglobulin G formation to GPI-anchored antigens mediated by NKT cells. Science 283: 225-229. Duthie, M. S., M. Wleklinski-Lee, S. Smith, T. Nakayama, M. Taniguchi, S. J. Kahn. 2002. During Trypanosoma cruzi infection CD1-restricted NK T cells limit parasitemia and augment the antibody response to a glycophosphoinositol-modified surface protein. Infect. Immun. 70: 36-48. Molano, A., S.-H. Park, Y.-H. Chui, S. Nosseir, A. Bendelac, M. Tsuji. 2000. Cutting edge: the IgG response to the circumsporozoite protein is MHC class II-dependent and CD1d-independent: exploring the role of GPIs in NK T cell activation and antimalarial response. J. Immunol. 164: 5005-5009. Romero, J. F., G. Eberl, H. R. MacDonald, G. Corradin. 2001. CD1d-restricted NKT cells are dispensable for specific antibody responses and protective immunity against liver stage malaria infection in mice. Parasite Immunol. 23: 267-269. Procopio, D. O., I. C. Almeida, A. C. C. Torrecilhas, J. E. , L. Teyton, L. R. Travassos, A. Bendelac, R. T. Gazzinelli. 2002. Glycophosphatidylinositol-anchored mucin-like glycoproteins from Trypanosoma cruzi bind to CD1d but do not elicit dominant innate or adaptive immune responses via the CD1d/NKT cell pathway. J. Immunol. 169: 3926-3933. Lantz, O., A. Bendelac. 1994. An invariant T cell receptor α chain is used by a unique subset of major histocompatibility complex class I-specific CD4+ and CD4−8− T cells in mice and humans. J. Exp. Med. 180: 1097-1106. Behar, S. M., T. A. Podrebarac, C. J. Roy, C. R. Wang, M. B. Brenner. 1999. Diverse TCRs recognize murine CD1. J. Immunol. 162: 161-167. Cardell, S., S. Tangri, S. Chan, M. Kronenberg, C. Benoist, D. Mathis. 1995. CD1-restricted CD4+ T cells in major histocompatibility complex class II-deficient mice. J. Exp. Med. 182: 993-1004. Exley, M., J. Garcia, S. P. Balk, S. Porcelli. 1997. Requirements for CD1d recognition by human invariant Valpha24+CD4−CD8− T cells. J. Exp. Med. 186: 109-120. Grubor-Bauk, B., A. Simmons, G. Mayrhofer, P. Speck. 2003. Impaired clearance of herpes simplex virus type 1 from mice lacking CD1d or NKT cells expressing the semivariant Vα14-Jα281 TCR. J. Immunol. 170: 1430-1434. Ashkar, A. A., K. L. Rosenthal. 2003. Interleukin-15 and natural killer and NKT cells play a critical role in innate protection against genital herpes simplex virus type 2 infection. J. Virol. 77: 10168-10171. Denkers, E. Y., T. Scharton-Kerston, S. Barbieri, P. Caspar, A. Sher. 1996. A role for CD4+NK1.1+ T lymphocytes as major histocompatibility complex class II independent helper cells in the generation of CD8+ effector function against intracellular infection. J. Exp. Med. 184: 131-139. Denkers, E. Y., A. Sher. 1997. Role of natural killer and NK1+ T-cells in regulating cell-mediated immunity during Toxoplasma gondii infection. Biochem. Soc. Trans. 25: 699-703. Smiley, S. T., M. H. Kaplan, M. J. Grusby. 1997. Immunoglobulin E production in the absence of interleukin-4-secreting CD1-dependent cells. Science 275: 977-979. Exley, M. A., N. J. Bigley, O. Cheng, A. Shaulov, S. M. A. Tahir, Q. L. Carter, J. Garcia, C. Wang, K. Patten, H. F. Stills, et al 2003. Innate immune response to encephalomyocarditis infection mediated by CD1d. Immunology 110: 519-526. Mendiratta, S. K., W. D. Martin, S. Hong, A. Boesteanu, S. Joyce, L. Van Kaer. 1997. CD1d mutant mice are deficient in natural T cells that promptly produce IL-4. Immunity 6: 469-477. Kawano, T., J. Cui, Y. Koezuka, I. Toura, Y. Kaneko, H. Sato, E. Kondo, M. Harada, H. Koseki, T. Nakayama, et al 1998. Natural killer-like nonspecific tumor cell lysis mediated by specific ligand-activated Vα14 NKT cells. Proc. Natl. Acad. Sci. USA 95: 5690-5693. Johnson, T. R., S. Hong, L. Van Kaer, Y. Koezuka, B. S. Graham. 2002. NK T cells contribute to expansion of CD8+ T cells and amplification of antiviral immune responses to respiratory syncytial virus. J. Virol. 76: 4294-4303. Nieuwenhaus, E. E. S., T. Matsumoto, M. Exley, R. A. Schleipman, J. Glickman, D. T. Bailey, N. Corazza, S. P. Colgan, A. B. Onderdonk, R. S. Blumberg. 2002. CD1d-dependent macrophage-mediated clearance of Pseudomonas aeruginosa from lung. Nat. Med. 8: 588-593. Kumar, H., A. Belperron, S. W. Barthold, L. K. Bockenstedt. 2000. Cutting edge: CD1d deficiency impairs murine host defense against the spirochete, Borrelia burgdorferi. J. Immunol. 165: 4797-4801. Arrunategui-Correa, V., H. S. Kim. 2004. The role of CD1d in the immune response against Listeria infection. Cell. Immunol. 227: 109-120. Hansen, D. S., M.-A. Siomos, L. Buckingham, A. A. Scalzo, L. Schofield. 2003. Regulation of murine cerebral malaria pathogenesis by CD1d-restricted NKT cells and the natural killer complex. Immunity 18: 391-402. Hansen, D. S., M. A. Siomos, T. de Koning-Ward, L. Buckingham, B. S. Crabb, L. Schofield. 2003. CD1d-restricted NKT cells contribute to malarial spenomegaly and enhance parasite-specific antibody responses. Eur. J. Immunol. 33: 2588-2593. Johnson, L. L.. 1992. SCID mouse models of acute and relapsing chronic Toxoplasma gondii infections. Infect. Immun. 60: 3719-3724. Johnson, L. L., P. Lanthier, J. Hoffman, W. Chen. 2004. Vaccination protects B cell-deficient mice against an oral challenge with mildly virulent Toxoplasma gondii. Vaccine 22: 4054-4061. Kasper, L. H., M. S. Bradley, E. R. Pfefferkorn. 1984. Identification of stage-specific sporozoite antigens of Toxoplasma gondii by monoclonal antibodies. J. Immunol. 132: 443-449. Johnson, L. L., K. N. Berggren, F. M. Szaba, W. Chen, S. T. Smiley. 2003. Fibrin-mediated protection against infection-stimulated immunopathology. J. Exp. Med. 197: 801-806. Gazzinelli, R. T., S. Hayashi, M. Wysocka, L. Carrera, R. Kuhn, W. Muller, F. Roberge, G. Trinchieri, A. Sher. 1994. Role of IL-12 in the initiation of cell mediated immunity by Toxoplasma gondii and its regulation by IL-10 and nitric oxide. J. Eukaryot. Microbiol. 41: 9S. Assarsson, E., T. Kambayashi, J. K. Sandberg, S. Hong, M. Taniguchi, L. Van Kaer, H. G. Ljunggren, B. J. Chambers. 2000. CD8+ T cells rapidly acquire NK1.1 and NK cell-associated molecules upon stimulation in vitro and in vivo. J. Immunol. 165: 3673-3679. Slifka, M. K., R. R. Pagarigan, J. L. Whitton. 2000. NK markers are expressed on a high percentage of virus-specific CD8+ and CD4+ T cells. J. Immunol. 164: 2009-2015. Baron, J. L., L. Gardiner, S. Nishimura, K. Shinkai, R. Locksley, D. Ganem. 2002. Activation of a nonclassical NKT cell subset in a transgenic mouse model of hepatitis B virus infection. Immunity 16: 583-594. Mizoguchi, A., E. Mizoguchi, H. Takedatsu, R. S. Blumberg, A. K. Bhan. 2002. Chronic intestinal inflammatory condition generates IL-10-producing regulatory B cell subset characterized by CD1d upregulation. Immunity 16: 219-230. Bleicher, P. A., S. P. Balk, S. J. Hagen, R. S. Blumberg, T. J. Flotte, C. Terhorst. 1990. Expression of murine CD1 on gastrointestinal epithelium. Science 250: 679-682. Colgan, S. P., R. M. Hershberg, G. T. Furuta, R. S. Blumberg. 1999. Ligation of intestinal epithelial CD1d induces bioactive IL-10: critical role of the cytoplasmic tail in autocrine signaling. Proc. Natl. Acad. Sci. USA 96: 13938-13943. Buzoni-Gatel, D., H. Debbabi, F. J. D. Mennechet, V. Martin, A. C. Lepage, J. D. Schwartzman, L. H. Kasper. 2001. Murine ileitis after intracellular parasite infection is controlled by TGF-β-producing intraepithelial lymphocytes. Gastroenterology 120: 914-924. Arase, H., N. Arase, Y. Kobayshi, Y. Nishimura, S. Yonehara, K. Onoe. 1994. Cytotoxicity of fresh NK1.1+ T cell receptor α/β+ thymocytes against a CD4+CD8+ thymocyte population associated with intact Fas expression on the target. J. Exp. Med. 180: 423-432.